The original Castello Plan. Full size photograph of manuscript map in the Biblioteca Medicea-Laurenziana of Florence, Italy. 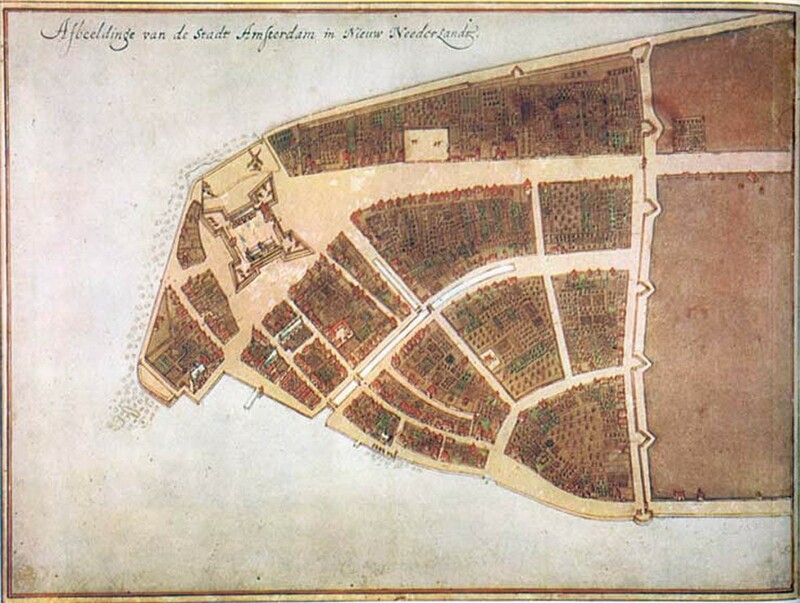 The Castello plan is the earliest known plan of New Amsterdam, and the only one dating from the Dutch period. 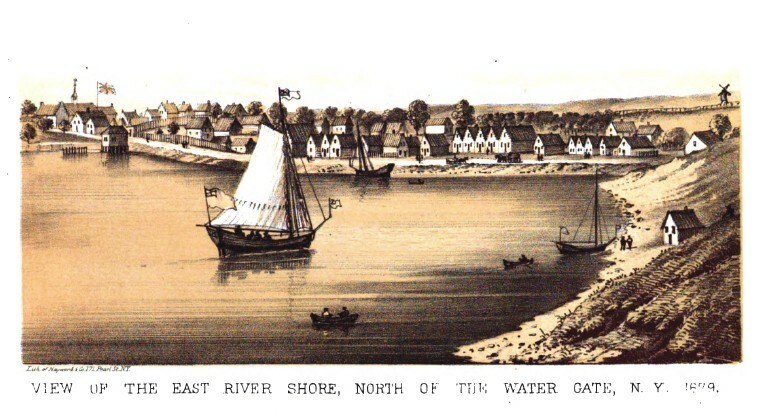 The text at the top of the image states: “Image of the city Amsterdam in New Netherland”. Country Store: interior, Ewen Avenue, Spuyten Duyvil, Bronx. October 11, 1935. 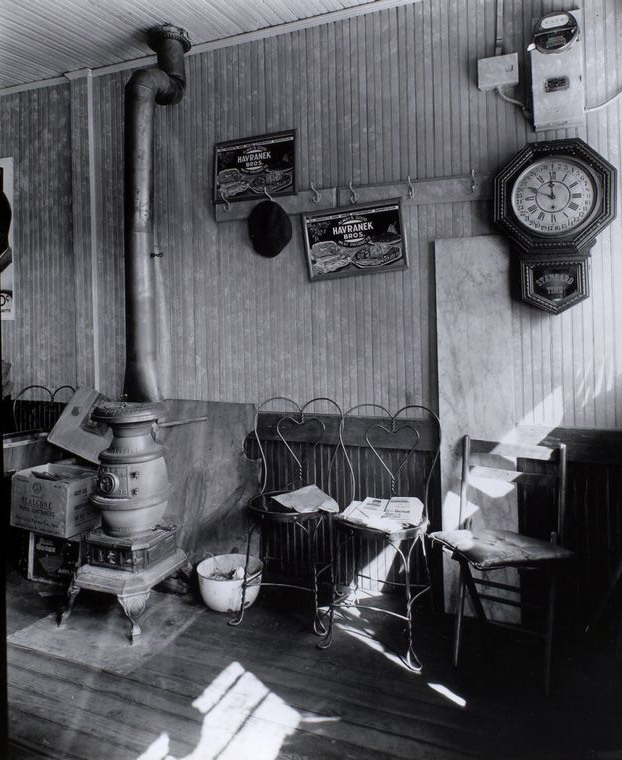 NYPL Notes: Wire “ice-cream” parlor” chair near pot bellied stove, clock, signs, hat rack on wall above. Source: Changing New York. : The New York Public Library. Photography Collection, Miriam and Ira D. Wallach Division of Art, Prints and Photographs. 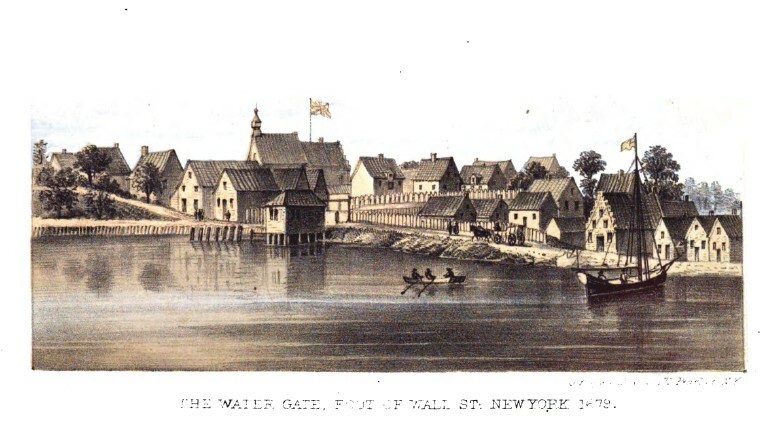 This view looking along the shore of the East river appears to have been taken from a point near the corner of the present Fulton and Water streets It shows the north side of the dock the water gate from the north and the shipping The church and Stadthuys are not distinctly seen as the sketch was probably taken from near the water level A portion of this sketch has been used in compiling the view on plate IX. 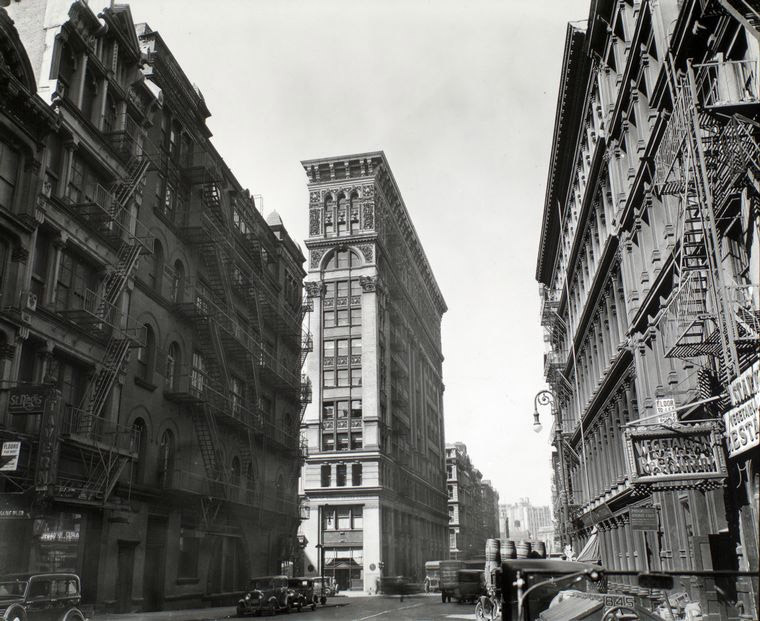 Broome Street, Manhattan. October 9, 1935. NYPL Notes. 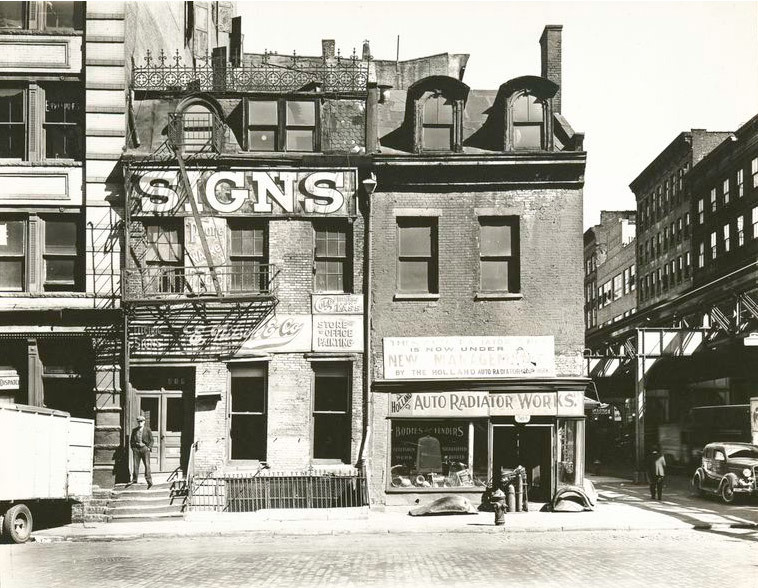 Sign company with decorative ironwork along roof, auto radiator shop, in three-story buildings, the elevated railroad just visible at right. Source: Changing New York. : The New York Public Library. Photography Collection, Miriam and Ira D. Wallach Division of Art, Prints and Photographs. 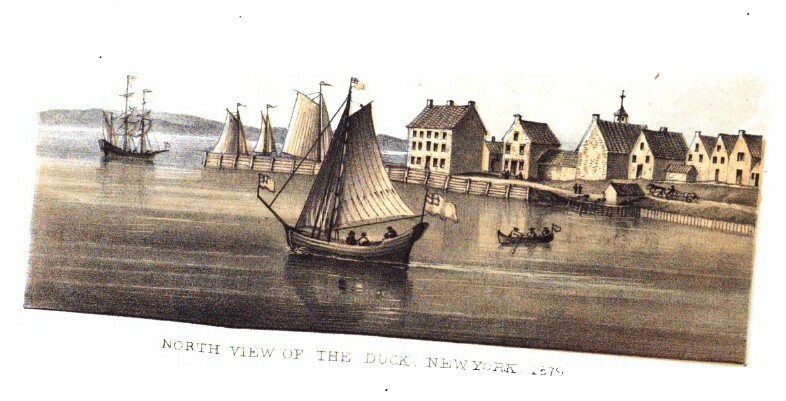 This view taken from Brooklyn heights will prove exceedingly interesting to the local antiquarians of New York from the number of details which are given of the city as it was in 1679 The draughtsman has tried to copy what he saw with minute accuracy and without the least attempt to produce any effect The city was at this time just beginning to creep beyond the palisades on Wall street which for fifty years had bounded it on the north It is unnecessary here to describe the different details represented which no doubt will be studied and compared with other views and with plans and documents of the period We merely draw attention to the accuracy of the view as proved by the fact that one block the left hand one in the view with thirteen houses corresponds precisely with the plan given in Valentine’s Manual of the Corporation of New York which shows fourteen lots on the same block fronting on Pearl street or the Heere graft The middle house in the view occupies two of these lots testing therefore the precision of the drawing The fort with its church the dock the Stadthuys the halfmoon forts the guard house at the water gate foot of Wall street the ship yards and the windmills on the hill near the corner of the present Fulton street and Broadway are all to be seen in this curious sketch From it an enlarged view of the Stadthuys once the city tavern has been made and is given on plate VIII.